A flower-loving bull named Ferdinand is mistaken for a dangerous fighter after he is stung by a bee. He is then taken to a camp where matadors select bulls to be their competition. He may be forced to fight but will do everything in his power to prevent that from happening. Ferdinand may have been the original 'flower child.' Don't believe us? He held strong beliefs in 'flower power' and non-violent resistance. Okay, maybe he just really liked the smell of flowers. "Ferdinand" is the latest film from Blue Sky Studios, which is known for producing animated features like the "Ice Age" franchise and the "Rio" franchise. The story itself is based on a 1936 children's book "The Story of Ferdinand" by Munroe Leaf, which was adapted once before by Disney into the 1938 Oscar-winning short film "Ferdinand the Bull." This film stars John Cena as the voice of Ferdinand, who, despite being the strongest and mightiest bull in the yard, is far happier sniffing flowers under a tree and spending time with his friend Nina, voiced by Julia Saldanha as a little girl and Lily Day as a slightly older adolescent girl. When the flower festival comes to town, Ferdinand is supposed to stay home now that he's a giant bull. He likes flowers so much that he can't stay away. 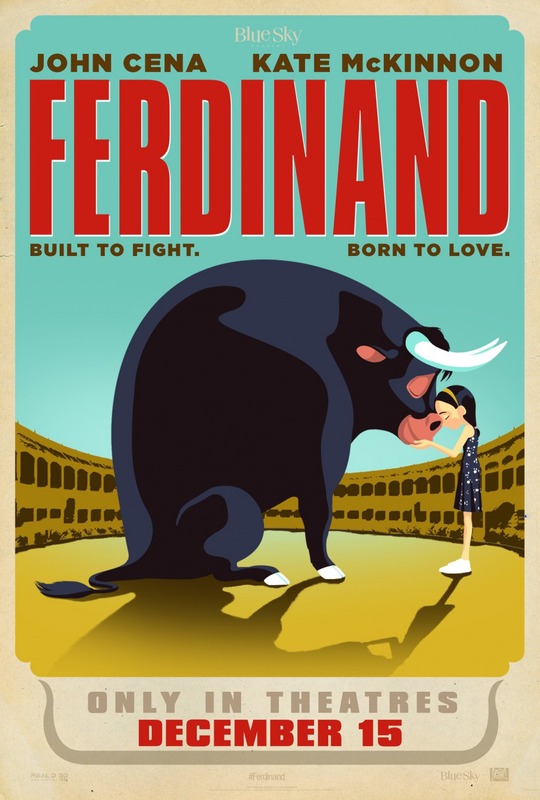 After getting stung by a bee makes him accidentally rampage through town in pain, Ferdinand is captured and sent to a camp where matadors select bulls to fight. Now, he must find a way to escape or fight for his life in an arena for the entertainment of an audience. Joining Cena in the film are Kate McKinnon, Bobby Cannavale, Anthony Anderson, Gina Rodriguez, Daveed Diggs, David Tennant, Gabriel Iglesias, and even Peyton Manning of all people. We weren't exactly looking forward to "Ferdinand" and put off watching it for quite some time. We were wondering what Blue Sky could possibly do to stretch a 36-page illustrated kids book into a 100-minute feature. We feared it would lose the general sweet-natured sentiment of the original story. Luckily, "Ferdinand" does a good job of staying relatively true to the spirit of the story. There is a lot of heart in the movie, and Ferdinand is an extremely likable character. It does have the standard kid's movie message of "you can be true to who you are and be what you want to be in life, even if what you want to be is a flower-sniffing bull." There is also a bit of a tragic undertone to the whole thing as the young bulls watch their fathers going off to fight in the arena and never come back. Later, we see the bulls who don't have what it takes to be fighters get shipped off to the chop house. It may be a bad idea to take your kids out for a burger after seeing "Ferdinand." Overall, this movie is way funnier than we thought it would be and brings about several big laughs here and there, which luckily far outnumber the eye-rolling, groan-worthy moments. John Cena does an excellent job playing a timid, sympathetic, lovable main character and his supporting cast does a great job alongside him. Kate McKinnon does a good job as Lupe the goat, though it is a very McKinnon-like character with all the bizarre eccentricities we see from her silly style of comedy. Chances are, if you don't like her, you won't like the goat, and the goat is in a lot of the movie. Others like Gabriel Iglesias, Gina Rodriguez, David Tennant, and Bobby Cannavale each get their moment to shine and round out a wonderful ensemble cast. In the end, "Ferdinand" is an above average kids film. It is one of the better animated features of the year. It's full of heart, silliness, and decent animation.